Chipping from a tight lie to the green. The short game is a very important part of shooting lower scores. Golfers will have many shots around the green during a round of golf. Shots around the green are played very differently based on the length of the shot and lie of the ball. A short chip shot from a tight lie around the green is one shot that strikes fear in the hearts of many amateur golfers. Learning the right club selection and technique for this shot will make life around the greens much easier. With a little practice, you can begin to save par from any tight lie. Select a lofted club with very little bounce. For most golfers, this will be a lob wedge or pitching wedge. Hitting a wedge with little bounce will allow the club to make a small divot when striking the ground, rather than bounce off the ground. Do not use a sand wedge off a tight lie because it is designed with too much bounce. Set up to the ball with your feet close together and your weight mostly on your front foot (left foot for right-handed golfers). Position the ball in the middle of your stance and press your hands forward slightly. Pressing your hands forward and positioning your weight on your front foot will help you strike down on the ball. Swing the club back on a fairly upright path. A slightly more upright swing will help you strike down on the ball and make clean contact. Keep your backswing short and your weight on your front foot. 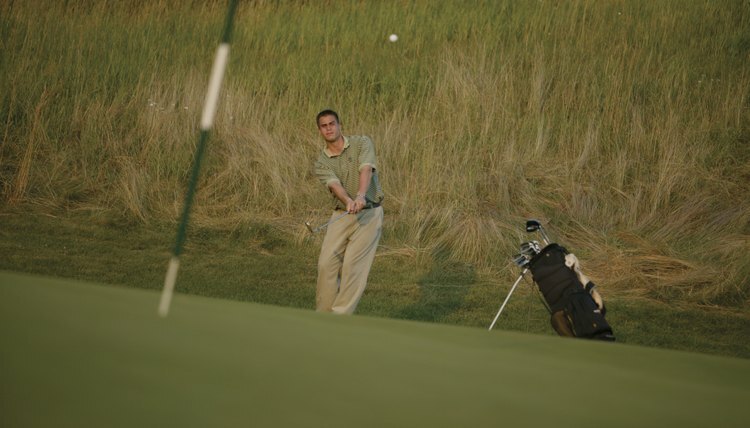 Keep your hands pressed slightly ahead of the club as you strike down on the ball. You should make a very small divot off a tight lie. Follow through the same distance as your backswing and keep your weight on your front foot.